After three weeks of stalled investigation, the Vermont Bureau of Retail Crimes announced a major breakthrough today in their investigation of the high-profile heist of a Keebler cookie trailer on I-89 in Middlesex last month. Forensic analysis has revealed a possible link to satanism, according to Mitch Swinton, Director of Vermont’s Major Retail Crimes Unit. Forensic analysis revealed the numbers “666” and an upside-down cross written in bold black paint on the trailer’s front drivers’-side corner, beside the lower corner of the Keebler mural. The symbols, less than three inches in height, are obscure to a casual observer but clearly legible in the enlarged photos. The V.B.R.C. has hired Coleen Dwindell, a Connecticut detective who specializes in satanic crimes, as a consultant on the case. It will be weeks before she issues her official report, but at today’s press conference Dwindell said the symbols are clearly satanic. 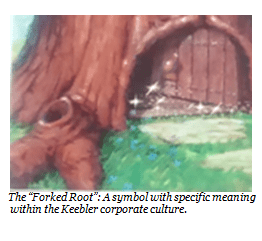 Dwindell said that other Keebler trucks and billboards have been marked by satanists in southern New England, and that the position of the symbols, adjacent to the forked root in the Keebler tree, could be significant. The Bureau of Retail Crimes is awaiting Dwindell’s official report before moving to the next phase of the investigation. In the meantime the agency is urging the public not to jump to conclusions. Swinton said the agency welcomes any information it might get from the public in solving the case.